The Shidu (Ten Crossing) Scenic Area is located on the upper and middle reaches of the Juma River in the Fangshan District. 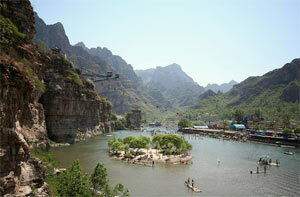 It is the largest scenic area featuring limestone, peak, and river valley in North China. The place was named after ten ferries along the Juma River. Covering an area of 301 square kilometers, it has beautiful mountains and rivers, precipitous cliffs, forests, deep ponds, and elegantly-shaped rocks. In 1986, Shidu was cited as one of Beijing's Top 16 New Tourist Attractions. In 1999, it was listed among the first group of Scenic Spots in Beijing. The Juma River winds its way through mountains like a jade belt, forming a perfect picture together with the peaks and forests. Along the riversides are more than 100 scenic wonders, such as the Natural Stone Buddhist Statue, Rock Flying from Afar, A Thread of Sky, Rock in the Rocks, Gushan Village, Celestial Peak Ravine, Wonderful Gully of Ten-Thousand Scenic Spots, Immortal-Residing Cave, Heavenly Lake Mountain, Five-Star Ravine, and so on.